GREENWOOD VILLAGE – RE/MAX Masters Millennium of Greenwood Village has been recognized as the top producing single-office RE/MAX franchise in the nation for total closed sales volume in 2016. 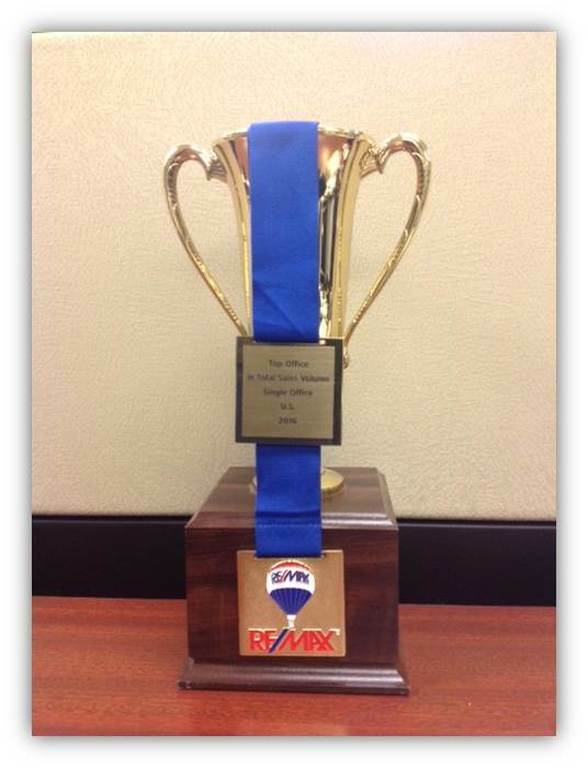 This is the fourth consecutive year that RE/MAX Masters Millennium has garnered the coveted award. RE/MAX Masters Millennium Managing Broker and owner James T. Wanzeck received the prestigious award this week from RE/MAX LLC, a distinguished honor that places RE/MAX Masters Millennium among the elite of all real estate offices in the nation. RE/MAX Masters Millennium was also ranked among the 2017 REAL Trends 500, an annual list of the nation’s top producing real estate firms that out-performed the market compared against the results reported by the National Association of Realtors and the National Association of Home Builders. The REAL Trends 500, now in its 30th year, is the undisputed leader in ranking the performance of residential real estate firms. Based in Denver, the REAL Trends 500 is the most trusted source of information about the performance of these companies. RE/MAX Masters recently formed RE/MAX Masters Property Management LLC to provide a comprehensive range of property management and leasing services to real estate investors and tenants who require expert advice. Wanzeck, in conjunction with Broker Associates Steve Olson and Eugene O’Brien, are spearheading the new division. RE/MAX Masters Property Management will provide extensive services in the management of residential properties, including real estate counseling, realistic market assessments, outlining goals and opportunities, assessing risk, and providing proven tactics to maximize residential real estate holdings. The new entity will serve clients in the relocation category, investors, 1031 exchanges, renters, first-time buyers, and clients in need of passive or active asset management. RE/MAX Masters Millennium operates from a state-of-the-art office in Greenwood Village featuring the very latest technology available in the industry, which has always been a primary focus of the top producing company. The office showcases an Event’s Center that serves as a spacious venue for clients to view the company’s listings on a flat screen television, and as a training and education center for the company’s brokers. The stand-alone office at The Commons encompasses 17,000 square feet, ample parking, a reception area, a Land Title office, an in-house real estate attorney’s office, plus insurance and mortgage lender offices.